Once again it is challenge time for Elizabeth Craft Designs Design Team. This month our challenge is to create a Christmas card using flowers and or foliage. My card today uses Susan’s Garden Notes Small Poinsettia, newly released Hawthorne Berries and Pine Boughs along with new Garden Notes Cornucopia. Be sure to visit Elizabeth Craft Designs Blog to see what all the other design team members have created and enter for a chance to win $20.00 gift card. The question for this month is – Which Elizabeth Craft Designs flower or foliage die or stamp set would you chose to create a Christmas card or decoration. Step 1 Cut 2-3 Garden Notes Hawthorne Berries from either green cardstock or white Soft Finish Cardstock. If cut in green cardstock shade using Distress Ink if cut in white color with alcohol markers (green cardstock used here). Susan has a tutorial found here Using red Nuvo Crystal Drops (Autumn Red used here) add berries to branch set aside to dry then add berries to back side and let dry. Step 2 Cut 2 Garden Notes Cornucopia from light brown cardstock that has Clear Double Sided Adhesive on back. Adhere one on top of the other then shade with Distress Ink. Lay right side down on molding mat using large ball tool rub all over back giving shape. Step 3 Form 5″ X 7″ card base. Cut patterned paper 4-3/4″ X 6-3/4″ adhere to card front using Clear Double Sided Adhesive. Step 4 Add pop dots down center of Cornucopia adhere to card front. Step 5 Arrange Garden Notes Hawthorne Berries in Cornucopia adhere using Kids Choice Glue. 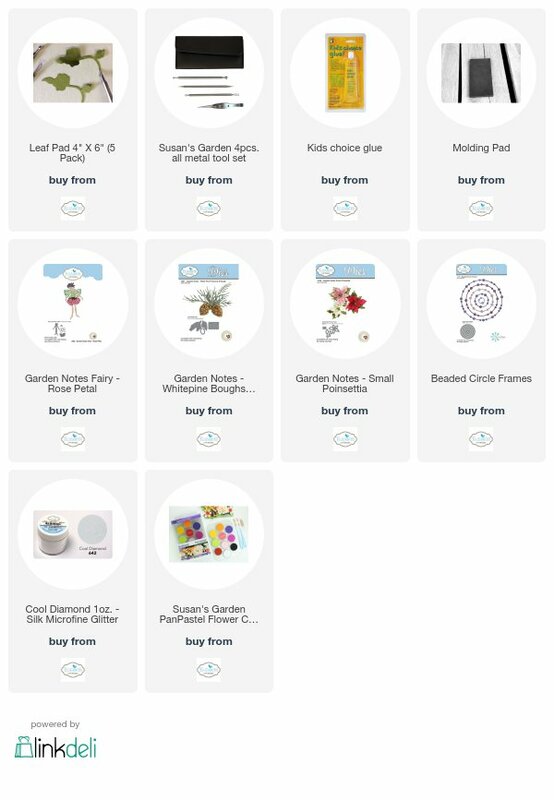 Step 6 Create 3 white Garden Notes Poinsettia – Small. Using Kids Choice Glue to attach to arrangement. Step 7 Cut a few Garden Notes Pine Boughs from green cardstock shade, pinch up needles add to arrangement. Step 8 Cut Suzanne Cannon’s A Way With Words – Season’s Greetings twice – 1 from black cardstock and 1 from gold both with Clear Double Sided Adhesive on back. Add black to top of card front then adhere gold on top offsetting just a little to give it a shadow. I do hope you have enjoyed this tutorial today and don’t forget to go to Elizabeth Craft Designs Blog to see what all the other design team members have created and to answer question for a chance to win. 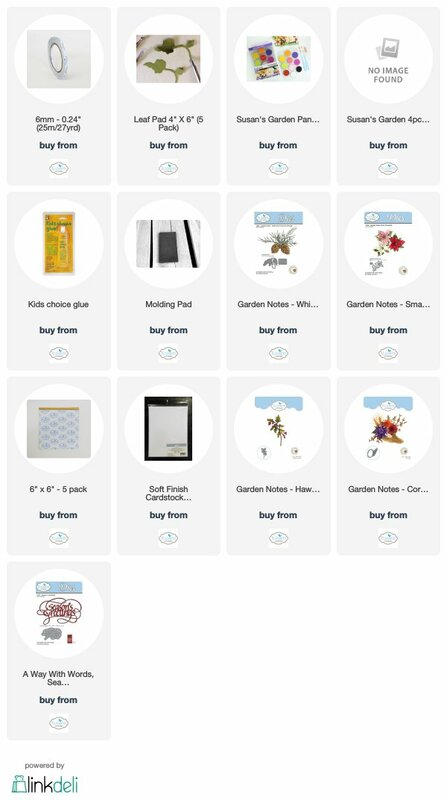 Supply list can be found below by clicking on any of the pictures it will take you directly to their site for purchasing. Thank you for visiting my blog today and until next time – Happy Crafting! Welcome to my blog thanks for coming. It is time for another challenge for Susan’s Garden Design Team. This challenge is to use one of Susan’s Fairy die sets. Be sure to visit Elizabeth Craft Designs Blog at this link to enter to win details below. The winners will be announced on Friday, October 13th, on the Elizabeth Craft Designs blog. For my challenge card I chose to use Susan’s Garden Notes Fairy – Rose Petal on a Christmas card using a non traditional Christmas color which is pink as I usually reserve it for floral cards not Christmas cards. My fairy is sprinkling snow onto flowers below. White cardstock cut 6″ X 12″ scored at 6″ folded on score line to form 6″ X 6″ tent fold card base. Using Els van de Burgt Beaded Circle Frames cut 2 from silver mirror cardstock and 1 from pink glitter cardstock using largest die in set. Use next to largest die in set as a mask in center of card. Using stipple brush and light pink ink stipple all outer edges (Distress Ink Spun Sugar used here). Using Kids Choice Glue adhere beaded frames to card front silver – pink – silver staggering from top to bottom. Using Suzanne Cannons Noel die cut 1 from silver mirror cardstock and 1 from pink glitter cardstock. Adhere pink to top of silver offsetting just a bit to give it a shadow effect using Kids Choice Glue. Adhere in center of card. Using Susan’s Garden Notes Fairy – Rose Petal cut 2 bodies 1 with Clear Double Sided Adhesive on back of cardstock. Use either skin tone cardstock or use white Soft Finish Cardstock color with skin tone markers. Adhere the two together giving depth and strength. Cut rose petals from light pink cardstock. Color fairy’s hair, dress top and shading on rose petals using markers. Using Susan’s 4 piece Deluxe Tool Kit shape petals adhere to fairy for skirt. For wings cut 2 from vellum that has Clear Double Sided Adhesive on top. Remove protective paper sprinkle on Cool Diamond Silk Microfine Glitter tap off excess then burnish in gently with finger. Fold 1 set of wings back adhere to back of second set wings using Kids Choice Glue. Adhere to fairy back. Make 2 pinecones and several white pine boughs using Susan’s Garden Notes White Pine Boughs & Pinecone. Susan has a great video for creating these you can find it here. Make 1 white poinsettia using Susan’s Garden Notes Small Poinsettia. Susan also has a great video for this as well you can find it here. Adhere boughs to lower left side of frames using Kids Choice Glue. Add pinecones, poinsettia and a few poinsettia leaves. Using dimensional tape adhere fairy to upper right side of frames. Dab a bit of Kids Choice Glue on areas of pinecones, pine boughs, poinsettia, fairy’s hair and some in her hand then sprinkle Papericious Frosting Powder tape off excess set aside to dry. Hope you have enjoyed this tutorial and it has inspired you to make your own card. Be sure enter to win.